Alison Galloway answers questions regarding the decision to pull the student fee to fund NCAA athletics at UCSC from the campus ballot this year. Photo by Jasper Lyons. In a sharp turn of events, UC Santa Cruz administration extended NCAA funding through 2017-18, instead of ending the $1 million budget supplement next spring. This news comes just weeks after Chancellor George Blumenthal notified the athletic department that its proposed fee increase to support NCAA athletics was pulled from campus elections. 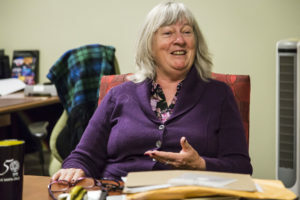 “The referendum was pulled because we have two other things coming up on facilities that actually need to be passed,” said Executive Vice Chancellor Alison Galloway. Those fees include the Student Life Facilities Fee (SLFF) and the Physical Education Program Fee (PEPF). SLFF is a $30 per-student-per-quarter fee that built and maintained the majority of current OPERS facilities, along with the Student Union and the Redwood Building in Quarry Plaza, which are governed by the Student Union Governance Board (SUGB). SUGB, an all-student committee that oversees the budget and renovations of its spaces including the Student Media Center along with the two Quarry spaces, will split from OPERS this election period. SUGB will propose a $10 per-student-per-quarter fee to maintain the costs of its facilities, and OPERS will campaign for its own $30 per-student-per-quarter fee to fund its facilities. The PEPF is already indefinite, however, but OPERS has a structural deficit and high demand for more classes. This fee will ask for an increase from $4.50 to $12.50 per student, per quarter to address these concerns. Last spring, Measure 62 asked each student to pay $117 quarterly, which would generate more than $5 million annually for athletics. The measure only got 2,292 votes — less than 40 percent of total student voters. With concrete plans to propose a similar fee this spring, UCSC Athletics Director Cliff Dochterman was surprised by the NCAA fee’s suspension. EVC Galloway said it was necessary to pull the NCAA referenda in this year’s election. During the last Academic Senate meeting, director of faculty athletics Daniel Wirls said there’s a lack of communication regarding the future of athletics funding. In an attempt to solve this problem, Wirls created a six-member senate committee on athletics. It will present the value of the athletic program to the Academic Senate, possibly including future recommendations as well. Dochterman sees the committee and extra year as an opportunity to strengthen faculty understanding of athletics. He said more endorsement from faculty would help build the foundation for understanding athletics, something he and Wirls agree has been lacking.